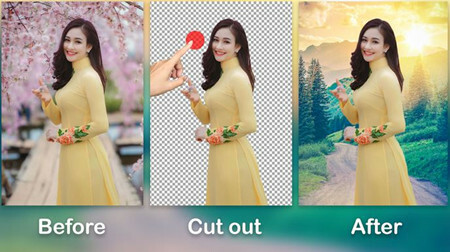 Main features: You can quickly combine two photos with or without removing background. It has 200+ filters and 15+ editing tools in it. You can make beautifull whatsapp status by using its Love, Motivational quotes and Shayaris. With large collection of free stickers you can make your images more fun. Method: Open app, you see two import box. Select two images there. Then go, then select image frame icon. Select and adjust the frame click center select button, then click ok(tick mark). Again click ok. Then the image will place on the other image. You can adjust position there. Click ok(Tick mark). Done! It will save to gallary. You can also share it to whatsapp, instagram, messenger etc.